When making a change, we often look outside ourselves for the answers. We look to see what jobs are hot. Or we base our choice on what seems most practical at the time. But authentic change comes from within. This kind of change can be uncomfortable, a bit untidy, and can take much longer than we like, but it’s reassuring to know that these stages are normal and happen to everyone and that you’re not alone. When you know what to expect, you can take some control over anticipating and managing change. In the first phase of the cycle, you’ve settled into a new career, relationship, ministry role, or life project etc..
• You feel focused, purposeful, and optimistic as you pursue your goals. • This can be an exciting and productive time. But unfortunately, it’s not meant to last. • At some point you’re going to start feeling dissatisfied with your work. • The activities that were once so fulfilling will begin to seem routine and less challenging. • You may find yourself wanting to call in sick more often, cutting corners, experiencing depression, lack of desire to be around others, no desire to pray/study your word. Either way, this brings you into the next phase. • You finally admit to yourself that you’re no longer happy in your work, relationship, in ministry. • You might feel burned out or stuck, unable to see a way ahead just yet. But as trapped as you may feel, you’re afraid to risk making significant changes in your life. When your work, ministry, life roles and your values are no longer a good fit, it’s a clear call for you to reassess your situation. A time-out is in order. • Taking time out from what’s no longer working is necessary before you can find a new direction for your life. • The cocooning phase is all about letting go of the “old you” of Phase 2, so you can open up to and create something new. • It’s a time of discomfort and withdrawal, as well as introspection and renewal. It’s very important that you let it happen. Be patient and let go, as scary as it is. You may be tempted to rush through it, or to return to work that no longer fulfills, anything to get rid of those uncomfortable feelings of not knowing what’s ahead. But the quiet, inside-out process of cocooning is an integral part of your transition, and it can’t be rushed. Just know that the answers will come, in time. After all, when you think about a cocoon, what’s in it? It’s the caterpillar dissolving in order to emerge at some point as a butterfly. Until it’s ready to fly, it remains un-formed. Gradually, as you get back in touch with your values and purpose, you’ll begin to create a new vision and see new possibilities for your life. After the often-uncomfortable cocooning stage comes a time of renewed optimism and creativity. This is a time for experimenting with the ideas that formed during the previous phase. As you explore new possibilities and try out new roles, you might take a class or two, learn new skills, and connect with people in the areas that interest you now. • You may find you don’t want to start over in an entirely new career. • Smaller changes may be all that are needed for you to feel refreshed and ready to reengage. And eventually you will find your way into Phase 1 again, with a renewed sense of purpose. 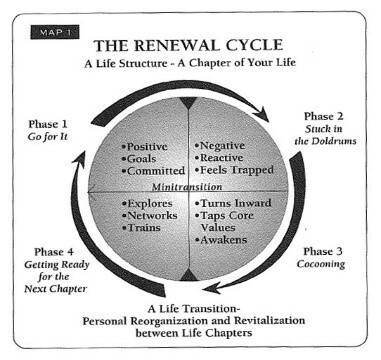 What phase of the Cycle of Renewal are you in?